The next Latin Mass in Hull will be on Wednesday 4th January at 6.30pm in the Church of St Charles Borromeo. The celebrant will be Fr Mark Drew, who is parish priest of Hornsea and Marton. There have been 1265 pageviews to this blog emanating from Russia in the last week, 690 of them being yesterday. I don't know what has caused this surge of interest. Ad Orientem in the Novus Ordo. Referring back to the previous post, I am still unaware of any parishes in England or Wales that have heeded Cardinal Sarah's suggestion of adopting ad orientem for novus ordo Masses. However, according to a report in the blog, New Liturgical Movement, the practice has been taken up to some degree in Croatia. If anyone knows of any parishes that have heeded Cardinal Sarah's suggestion, please leave a comment. The first Sunday of Advent has come and gone, and I have been looking into the extent to which parishes have have heeded Cardinal Sarah's suggestion that the new church year would be a good time to start celebrating the novus ordo form of the Mass ad orientem. In England and Wales, I have come across no examples, although I am sure that there are a few. In the USA, things are a little different. Two bishops, Bishop Robert Morlino of Maddison and Bishop James Conley of Lincoln have publicly stated that they will be celebrating ad orientem at their personal Masses. No doubt many of the priests in those two dioceses will be doing likewise at least on some occasions. Fr Zuhlsdorf reports on his blog that, according to one priest, there are 10 priests in the Diocese of Lacrosse who are adopting the practice. It would seem that in the States novus ordo Masses are beginning to be celebrated ad orientem in a significant number of locations. Of course, in this country Archbishop Nichols has all but ruled it out in the Archdiocese of Westminster and at least one other bishop has acted similarly. However, I often say that what happens in America frequently happens 10 years later in this country. So maybe we will have to wait a while for Cardinal Sarah's suggestion to be adopted here. A reminder that there will be a Requiem Mass at the Church of the Most Holy Sacrament at Marton on Saturday 5th November at Noon. I understand that it will be a Sung Mass. Wednesday 2nd November is the Feast of All Souls. It is also the first Wednesday of the month, so there will be a Requiem Mass for the faithful departed in St Charles Church at 6.30pm. The celebrant will be Fr Peter Mulholland. I usually take the collection at the noon Mass on Sundays at St Wilfrid's Church in York. As part of that job, I have to count the congregation each Sunday in October. I presume that the figures are added to the figures at the other Sunday Masses and passed on to some department in the Diocese of Middlesbrough, which in turn passes them on to to the bishop's conference. Regrettably, neither diocesan or national figures have been published in recent years. I understand that this is because many parishes either fail to make their return, or make one that is incomplete, or make one that contains figures that are obviously far from correct. In contrast, the Church of England publishes very detailed figures. Although the accompanying press release attempts to to present them in a very positive way, anyone wishing to delve into them can do so. The statistics for 2015 have just been published, and I have extracted what I believe to be the key figures. This figure must be fairly worrying for the CofE, as they have many churches that are Listed Buildings and are difficult to close. Also, with so many churches, they need to maintain the number of their clergy. When one comes to look at individual churches, there is even more to worry about. Of the 5% of churches with the smallest average October attendance, the average size of the congregation is 4. The average size of the October congregation at the smallest 25% of churches is just 14. One womders how long this can be sustained. I notice that Rt Rev Alan Hopes, Bishop of East Anglia, has been nominated by Pope Francis as a member of the Congregation for the Doctrine of the Faith and the Discipline of the Sacraments. Bishop Hopes should be congratulated on this, especially as he has proved to be well disposed towards the traditional form of the Mass. Less good news is that Archbishop Piero Marini, the former papal Master of Ceremonies has also been nominated. Last Sunday, there were about 40 in the congregation attending Vespers and Benediction at St Wilfrid's Church in York. I am fairly sure that this is the largest number yet, and compares with an attendance of about 90 at the Latin Mass earlier in the day. It seems that Vespers has a pulling power all of its own, as there are almost always new faces in the congregation, some of whom have travelled huge distances. Many are visitors to York who have stumbled on Vespers by chance. Others have made the deliberate decision to travel to York specially for Vespers. To anyone who has never attended Vespers in the traditional form, I recommend giving it a try. Essentially, it consists of the chanting of five psalms, followed by a hymn and the singing of the Magnificat. There is also a short reading and a collect. The chief attraction for me is the music. Each psalms is to a different chant mode, which keeps you alert, although the verses within each psalm all follow the same pattern, which simplifies matters. I also find attending Vespers a great help in improving my understanding of Latin. Because certain unusual words come up time and again within each psalm, I find that my Latin vocabulary improves with each time I attend. It is also improves one's fluency in reading Latin. Another bonus is being able to stay on for Benediction. I read today that eight former Anglican clergymen have commenced their studies to become Catholic priests in the Ordinariate of Our Lady of Walsingham. They join another one who is in his second year of studies. In view of their experience in the Church of England, former Anglican clergy are able to follow an accelerated course of training. In addition, there are two men training to become priests of the Ordinariate at Oscott College. Since these two were not formerly Anglican clergymen, they have to do the full seminary course of six years. I understand that both of them are half way through their training. If all goes well, the Ordinariate will have 11 new priests to add to the 90 that they have at the moment. This will mean that the Ordinariate will have more priests than many of the dioceses of England and Wales. I also keep reading of of lay people being received into the Church and joining Ordinariate groups. Unfortunately, like the Catholic Church in England and Wales as a whole, the Ordinariate does not publish figures for its general membership, but there is no doubt that it is growing at a steady, albeit slow, rate. An educated guess is that it has about 2,000 members. Many people dismiss the Ordinariate as insignificant or irrelevant, but the fact is that it is growing and here to stay. There will be a Requiem Mass at the Church of the Most Holy Sacrament in Marton on Saturday 5th November at 12 noon. It will be offered by Fr Mark Drew. This will be the fourth and final old rite Mass of the year at Marton. Since they are so infrequent, it would be nice to have a good sized congregation. The next monthly Latin Mass at St Charles Church in Hull is at 6.30pm on Wednesday 5th October. The celebrant will be Fr Peter Mulholland. 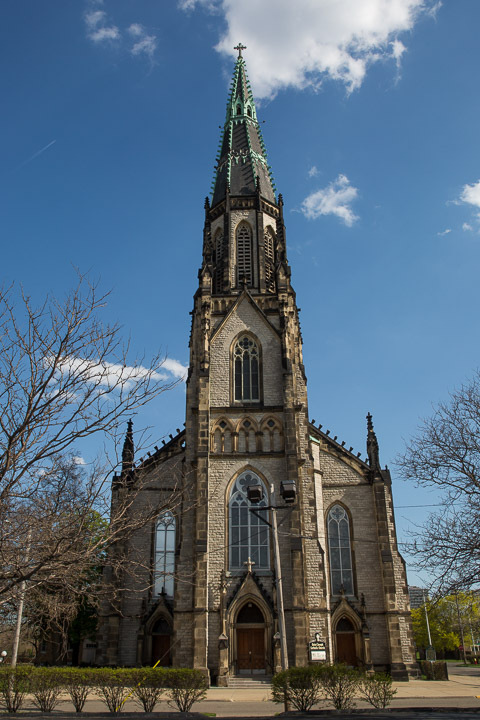 It has recently been announced that the Institute of Christ the King Sovereign Priest will be taking over the Church of St Joseph in Detroit. Originally built by the German community, it has more recently been merged with two other churches into the parish of the Mother of Divine Mercy. Despite being close to the downtown area of Detroit, the church is attractively situated amid green lawns and trees. Whilst clearly a fine church when viewed from the outside, one has to go inside to fully appreciate its splendour. Somehow it has escaped re-ordering. Original altar, communion rail, pulpit, sedilia and confessionals are all intact. The stained glass is also very good. Many pictures of this church can be found on the internet. The Institute will be taking charge of the church in the middle of October, and it will be their 13th church in the USA. I also understand that it will become a personal parish, which means that it will be detached from the existing clustered parish, and will become the sole responsibility of the Institute. This is a rather different status from the two churches that the Institute have in England. The date has been fixed for the 2017 pilgrimage in honour of St Margaret Clitherow and the Martyrs of York. It is Saturday 25th March. The pilgrimage will start at St wilfrid's Church in York with a Solemn Mass at 1.30pm, which will be followed by a procession through the city passing through the Shambles,where the shrine to St Margaret Clitherow is located. The pilgrimage will end with Benediction back at St Wilfrid's Church. After a break during August, Sunday Vespers have been resumed at St Wilfrid's Church in York. Since the Oratorian Fathers introduced Vespers on Sunday evenings a couple of years ago, the congregation has gradually grown. Last Sunday,the congregation was the largest that I have seen so far. Vespers is at 6pm each Sunday, and is followed at 6.30pm by Benediction. 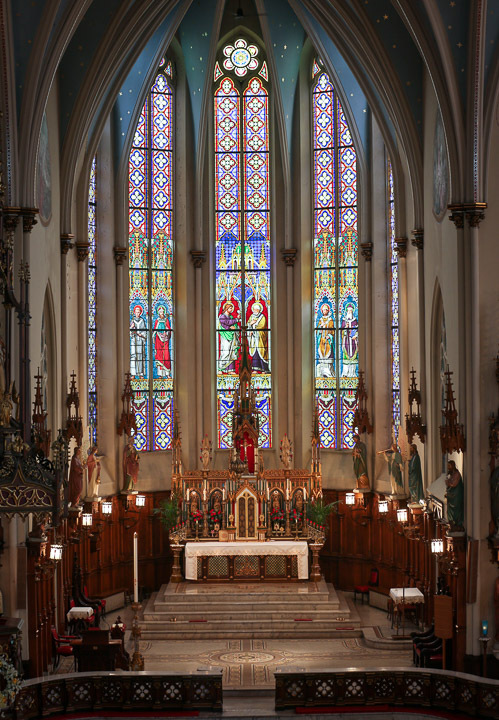 Bishop Robert Morlino, the Bishop of Madison in the United States, has announced that, starting in October, whenever he celebrates a Sunday Mass in in his cathedral, it will be celebrated ad orientem. The bishop does not say what will happen on those Sundays when he is not there. Neither does he say what will happen during the week. Nevertheless, this is a very clear statement in support of Cardinal Sarah, the Prefect of the Congregation for Divine Worship and the Discipline of the Sacraments, who has called on all priests to consider offering Mass ad orientem from the beginning of Advent. Bishop Morlino is to be congratulated on making such a clear statement. This is an example of how the bishops of the United States differ from those of England and Wales. In the US, bishops have a range of views, and are prepared to step out of line to express them. In this country, it is rare for any bishop to make a public statement that is likely to be controversial, or differ from the collective view of the Bishops' Conference. The Archbishop of Westminster has, of course, made it clear that there will be no return to ad orientem in the Diocese of Westminster, and a few bishops have made similar statements with regard to their own dioceses. I have been informed that the 11am weekly Sunday Mass at Sacred Heart Church, Lobster Road, Redcar will resume, starting on Sunday 11th September. I understand that Mgr Heslin, who has not been too well of late has recovered sufficiently to restart these Masses. We are very grateful to Mgr Heslin. The following is taken from an earlier newsletter of St Walburge's Church in Preston. There will be a Low Mass at St Charles Church in Hull this Wednesday, 5th September at 6.30pm. Please not that the Sunday Masses in Redcar are suspended until further notice. I am still recovering from the Walsingham Pilgrimage. Around 70 people took part in the 57 mile walk from Ely to Walsingham. My part was to drive one of the support vehicles, and to handle all the liturgical requisites used at the seven Masses we had during the pilgrimage. So I did not walk very far, but it was no less exhausting. There is plenty about the pilgrimage on the LMS Facebook pages and elsewhere. 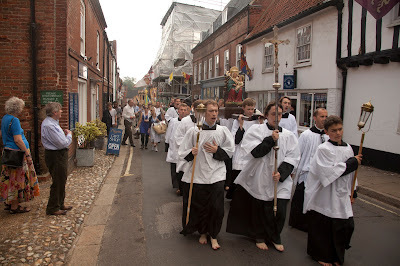 Some people just attended the Sunday Mass at the Shrine at Walsingham and then walked the Holy Mile. So there was a big crowd for that. I strongly recommend this pilgrimage, whether as a day visitor or as a full walking pilgrim. It takes place over the August Bank Holiday weekend each year. Please pray for the three young men from the U.K. who will be commencing their programme of priestly formation at the Institute’s seminary, Saint Philip Neri Seminary (Gricigliano), this September. They will be joining other young men from France, the U.S.A. and other countries. No less than three young men from the UK will be joining the Seminary of the Institute of Christ the King in Gricigliano this September. One has been a regular attender at the Church of SS Peter, Paul and Philomena at New Brighton, another has been attending St Walburga's Church in Preston, and I understand that the third is from Scotland. What excellent news! It will soon be September, which reminds me that there will be a Latin Mass in Hull on Wednesday 7th September. It will be at 6.30pm in the Church of St Charles. I was not able to attend the Solemn Mass for the Feast of the Assumption in York last night, although I am sure that it was an excellent occasion, with a visiting choir from St Austin's in Wakefield singing. The reason why I was not there was that I attended the Missa Cantata in Marton celebrated by Fr Mark Drew, with Fr Leworthy singing the propers. I was very impressed to see the size of the congregation (about 40), especially in view of the remoteness of the location. It proves that there are plenty of people about who are interested inthe Latin Mass. The website of the Catholic Herald includes an interesting article by Stephen Bullivant in which he asks the question: Could England's Catholic Church be entering a time of renewal? Most of the piece concerns the opening of the Syro-Malabar cathedral in Preston and the activities of the Syro-Malsbar Catholic community which he estimates at 40,000. Stephen Bullivant also refers to a number of other encouraging initiatives. These include the School of the Annunciation at Buckfast Abbey, the Sons of the Most Holy Redeemer in the Orkneys, the Sisters of the Gospel of Life in Glasgow, the Canons of St Ambrose and St Charles in Carlisle and the new Oratories in York, Manchester and Bournmouth. The Shrine Churches at New Brighton and Preston belonging to the Institute of Christ the King, and at Warrington belonging to the Priestly Fraternity of St Peter are also mentioned. It is noticeable that almost all the examples Stephen Bullivant gives relate to the more traditional movements in the Catholic Church. Indeed, most have a strong attachment to the Latin Mass. If Stephen Bullivant's examples are anything to go by, the future Church could not only be a flourishing Church, but one where the Latin Mass also flourishes. On Monday 15th August, the Feast of the Assumption, there will be two traditional Latin Masses in the diocese. 7pm Most Holy Sacrament, Marton. Missa Cantata. The Mass in Hull last night in Hull was attended by a congregation of about a dozen. Whilst this is more than the previous month, it is not as good as the 30 or so that we were getting several months ago. I am arguing the case for a regular Sunday Mass in Hull, and, if this is to happen, we have to demonstrate that enough people in the area interested in the Latin Mass to justify a priest devoting his precious time to it. So please continue to come along to St Charles Church at 6.30pm on the first Wednesday of each month. The Latin Mass Society's annual pilgrimage to Walsingham ts coming up very soon. Here is a picture from a few years ago. You don't actually have to walk bare foot, although, as you can see, quite a few people do. The closing date for those who want to walk the 55 miles from Ely to Walsingham is fast approaching. It is Mon 15th August. Don't leave it too late! For those not intending to walk, it is quite possible to attend as a day visitor. The Mass at Walsingham is at 2pm on Sunday 28th August, and it is followed by a procession along the holy mile, ending in the Abbey grounds fir final devotions. Day visitors can just turn up, but those undertaking the three day pilgrimage must book in on the LMS website. Tomorrow, being the first Wednesday of the month, there will be a Latin Mass at 6.30pm in the church of St Charles, Jarratt Street, Hull. Fr Mulholland will be the celebrant. Apologies for not publicising this earlier. I read in the newsletter of the Dome of Home that the Institute of Christ the King will have three British men joining their seminary in Gricigliano, near Florence, in September. This is great news for the Institute who have two English priests, but currently no seminarians from this country. I know two of the young men concerned and associate both of them with the shrine at New Brighton. Our hope must be that these three are the beginning of of a steady flow of new priests. The next Latin Mass in Hull will be a Low Mass on Wednesday 6th July at 6.30pm. As usual the celebrant will be Father Peter Mulholland. Wednesday 29th June, being the Feast of St Peter and St Paul, is a Holyday of Obligation. In fact it is one of very few holydays observed in the modern church. There will be a sung Latin Mass at St Wilfrid's Church in York at 6pm on that day. I recently read on the website of the Diocese of East Anglia that they currently have 8 seminarians training for the priesthood. In addition, one new student is due to start training later this year, and another next year. In addition to these, there are said to be 10 "nibblers" (expressions of interest). Considering that East Anglia is a relatively small diocese, these numbers look impressive, especially when compared with similarly sized dioceses, such as our own Middlesbrough. Looking at the website in a little more detail reveals that by the time that these 10 are ordained, about 20 of the existing clergy will have reached the age of 75, so the number of priests will continue to decline. Nevertheless, I suspect that East Anglia is doing better with vocations than any other diocese. There was a good turnout last night for the Sung Mass at the Church of the Blessed Sacrament in Marton. There were about 20 in the congregation, which I thought was good for such a remotely located church. In addition, there were two servers, a chorister and a priest in choir, as well as the celebrant, Fr Mark Drew. I was particularly pleased to see Fr Simon Leworthy, who had traveled from Bridlington to be in choir; and we are indebted to Mike Forbester who sang the propers of the feast. At the end, he sang the York version of the Salve Regina, which is considerably longer and more complicated than anything I am used to. There will be a Low Mass at the Church of St Charles in Hull on Wednesday 1st June at 6.30pm. Fr Pewter Mulholland will be the celebrant. On 21st May I reported on Bishop Libasci of Manchester, New Hampshire handing over care of the Church of St Stanislaus to the FSSP. I am sure that they will be delighted with the church building that they will be acquiring. Apparently, it became surplus to requirements for the celebration of Mass when parishes were merged a few years ago, but has been used for eucharistic adoration since then. On 27th May, I reported on a similar move by Bishop Barres of the Diocese of Allentown, who handed over the Church of St Stephen of Hungary to the FSSP. This seems to be a continuing trend, as there are now about 50 examples in the USA of former diocesan churches being in the care of traditional orders. I suppose one could add the churches run by the Society of St John Cantius, and possibly others, to the list. The example has been followed to a degree in England and Wales at New Brighton, Preston and Warrington, and one could add York and Bournemouth. There must be many other opportunities to hand over underused churches in our larger cities. Manchester, Liverpool and Birmingham are obvious examples, and opportunities probably exist in other cities like Bristol, Nottingham, Leeds, Derby and Newcastle. There may even be some suitable underused churches in our own Diocese of Middlesbrough. With iuncreasing numbers in the seminaries of both The Priestly Fraternity of St Peter and the Institute of Christ the King, Supreme Priest, including candidates from these British Isles, these orders will have the priests to staff to to take on more missions. Let us hope that the bishops of England and Wales will follow their American cousins, and make more churches available. Rorate Coeli has posted a report of another American bishop handing over responsibility for a parish parish to the Priestly Fraternity of St Peter. In this case it is Bishop John Barres of the Diocese of Allentown in Pennsylvania, and the parish is St Stephen of Hungary. I have often said that what is done in America today will happen this side of the Atlantic tomorrow. So maybe we can look forward to more churches being handed over to traditional orders in the future. A start has been made in New Brighton, Preston and Warrington, but there is a long way to go to catch up with the States, where about 50 churches are now in the hands of traditional orders. Bishop Barres should be congratulated for making this decision. Next Wednesday, being the first Wednesday of the month, there will be a Low Mass at 6.30pm at the Church of St Charles in Jarratt Street in Hull. The celebrant will be Fr Peter Mulholland. It has recently been announced that the Church of St Joseph in Pakington Street, Bradford, is to become the principal church in the Diocese of Leeds for the celebration of Mass in the Extraordinary Form. Making the announcement, Bishop Marcus Stock said that he had made the decision in response to numerous requests for a regular Extraordinary Form Sunday Mass at an easily accessible location in the Diocese. It is expected that the new arrangements will start in September, and that there will be a sung Latin Mass every Sunday at 12.30pm. It is probable that a roster of priests will be drawn up to celebrate this Mass, and it is not clear yet what impact the new arrangements will have on Latin Masses currently being celebrated in the diocese. Neither is it clear whether the church will be used for other traditional devotions besides the Sunday Mass. 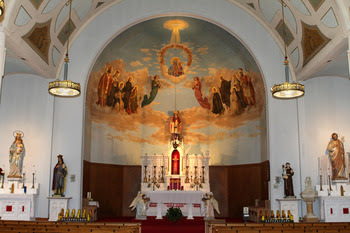 Rorate Caeli reports that the Bishop of Manchester in New Hampshire, Rt Rev Peter A Libasci, has handed over the church of St Stanislaus in Nashua to the Priestly Fraternity of St Peter to become a personal parish for those who adhere to the traditional form of the Mass. Originally built to serve the Polish community, the church was incorporated into another parish several years ago, since when it has been little used, with the prospect of closure and demolition never far away. It should be noted that Bishop Libasci has actually created a personal parish, in contrast to the developments in England, where churches have been handed over to traditional orders in New Brighton, Preston and Warrington to become shrine churches. In fact, the FSSP have charge of more than 30 parishes in the USA. 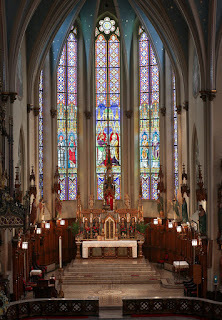 Whilst we must be very grateful to the bishops in England and Wales who have established shrine churches for the use of the traditional orders, matters have progressed a lot further in America, where the traditional orders have been put in charge of personal parishes in many dioceses. Congratulations are due to Bishop Libasci and all the other bishops of the USA who have been so welcoming to the to the traditional orders. Thursday 26th May is the feast of Corpus Christi. There will be a sung Mass at 6pm in the church of St Wilfrid in York. There will also be a Mass at 7pm at the Church of the Holy Sacrament at Marton. The annual pilgrimage pilgrimage to Holywell organised by the Latin Mass Society will take place this year on Sunday 3rd July. Solemn Mass will be celebrated by Canon Scott Tanner ICKSP at 2.30pm in the Church of St Winefride in Holywell, and that will be followed be a procession down the hill to the holy well, where there will be veneration of the relic. The day concludes with Benediction. This is a very long established pilgrimage in the Latin Mass Society, and has in the past attracted large crowds. According to the Daily Telegraph, the General Synod of the Church of Scotland will be holding a meeting next week, at which a proposal that baptisms might in future be conducted on line. That is without any need for the candidate to attend a church. Is it any surprise that the Church of Scotland is declining rapidly? Hard on the heels of the Cardiff Oratory announcement is news that there is also to be an Oratory at Bournmouth. Bishop Egan will be making the very fine church of the Sacred Heart in the centre of Bournmouth available for yet another Oratory project. This brings to four the number of new Oratories that have that have been announced in the last few years. These Oratories in formation are at Manchester, York, Cardiff and Bournmouth. There are also fully formed Oratories in Birmingham, London and Oxford. It seems that Oratories are in the vanguard when it comes to the re-evangelisation of England and Wales. Fr Michael Brown of Gateshead Revisited, has posted information about the formation of yet another Oratory in Cardiff. It seems as if it is to based around the University Chaplaincy. This story has taken a little while to come to the surface, According to Fr Brown, Archbishop Stack gave permission for the formation of an Oratory in the Archdiocese back on 11th February, and a formal decree was granted by the Confederation of Oratories on 22nd March. On 29th April the two founding members of the community were clothed, and it seems that it was at this point that the venture was made public. The community consists of Fr Sebastian Jones and Br Ambrose Jackson. Fr Sebastian is better known to many of us as Fr Gareth Jones who has been a strong supporter of the Latin Mass. As at York, the new venture will be an "Oratory in Formation" until such time as as the community grows in size and can demonstrate its stability. No Mass at Marton this week. The next Mass at the church of the Most Holy Sacrament at Marton will be on the feast of Corpus Christi. There will be the usual monthly Latin Mass at St Charles Church in Hull at 6.30pm this Wednesday, 4th May. On Thursday, being the Feast of the Ascension, there will be Latin Masses at 6pm in St Wilfrid's Church in York and 7.30pm at the Church of the Most Holy Sacrament at Marton. A record number of people attended Vespers at St Wilfrid's Church in York yesterday. The attendance has gradually grown since Vespers were introduced. For the first time polyphonic music was introduced to Vespers yesterday, with alternate verses of the hymn being sung by the choral scholars. I would urge anyone who is not familiar with Vespers to go along and experience it. It is at 6pm every Sunday, and is followed by Benediction. The next Latin Massto be held in Hull will be on 6th April. Fr Mulholland will be away at that time, so Fr Mark Drew will be the celebrant. I shall also be away, but there will be a server. The Mass will be at 6.30pm at the Church of St Charles in Jarratt St. So How Should the Demand for the Latin Mass be Satisfied? We must start from the premise that almost all diocesan priests are already overworked and would find difficulty taking on the celebration of additional Masses. It follows that, either more priests must be found or that Latin Masses will need to be provided in substitution for existing novus ordo Masses, rather than in addition. Taking the first point, there is an emerging source of priests who are more than keen to to provide usus antiquior Masses. I refer to the traditional Orders. The Priestly Fraternity of St Peter has had several Englishmen ordained to the priesthood in recent years, and expects to have a steady stream of ordinations during the next decade. There is every prospect that the number of vocations to the priesthood in the traditional orders will continue to grow. We have already benefited from the Institute of Christ the King Supreme Priest taking over churches in New Brighton and Preston, and the FSSP taking over one in Warrington. Although it is too soon to make a final judgement, the indications are that these are prospering as centres for traditional liturgies. It is to be hoped that as the traditional orders ordain more priests, churches will continue to be handed over to their care. This solution tends to work well in the larger towns that have several Catholic Churches, and where consideration is already being given to closing churches. This is surely a win-win solution. A second approach is for each diocese to consider where Latin Masses would be best located. In most cases, this would mean selecting churches in the greater centres of population, where larger congregations can be expected. Currently, Latin Masses are frequently provided in remote or village locations, and it is unsurprising that these attract small congregations. In the case of the Diocese of Middlesbrough, The obvious locations would be Hull, York, Scarborough and Middlesbrough itself, all of which have multiple churches. A process of merging parishes in in these locations has been going on for years, and surely such mergers should provide the opportunity to reconsider Latin Mass provision. Is there Sufficient Provision of Usus Antiquior Masses? A couple of months ago there appeared an article by one Monsignor Pope who argued that interest in the Traditional Latin Mass had reached a plateau, and was possibly even declining. His view was that the expansion in the provision of Latin Masses far exceeded the demand, with the consequence of too many poorly attended Masses. The implication was that the number of Latin masses should be reduced. He was speaking in an American context, where the response to summorum pontificum was more generous than at this side of the Atlantic. I will not comment on his arguments, as my knowledge of the American scene is limited. However, I do feel able to comment on the extent and adequacy of the provision to extraordinary form Masses in England and Wales. Prior to summorum pontificum, the extent, frequency and location of Latin Masses was largely at the discretion of the local ordinary, and provision varied markedly from diocese to diocese. In only a handful of dioceses was there a regular Sunday Mass in the older form at a convenient time, In most dioceses where there was provision for Sunday Masses, these took place at constantly moving locations, and at varying times, almost always in the afternoon. In the aftermath of summorum pontificum, there was a significant increase in the provision - the average number of Sunday Masses in England and Wales increasing from about 25 to about 50. Mostly, the additional Masses were scheduled on a roster basis so that followers of the traditional Mass were expected to travel to a different church each Sunday to attend Masses scheduled at different times. This was probably not a deliberate policy, but resulted from the difficulty in finding priests who were willing, and had the time, to celebrate additional Masses. The possibility of substituting an established Novus Ordo Mass by an Extraordinary Form one was hardly considered for obvious reasons. An additional point is that the location of EF Masses has generally been determined by the presence of a well disposed priests, rather than any strategic planning. As a consequence, it is not uncommon for there to be two Latin Masses relatively near to each other, when there are huge areas in the same diocese with no provision at all. This is something that can only be remedied by each diocese taking a lead and coming up with a coherent plan. The evidence is that this has not happened in most dioceses. The question of whether there is sufficient provision of usus antiquior Masses is not a simple one. If one just looks at the average size of the congregation at Latin Masses, it is clear that there is over-provision, as congregations are generally small. Looked at another way, there are many of the faithful who would dearly like to attend a Latin Mass, but cannot do so, because there is no provision in their area. This would suggest under-provision. One difficulty is in quantifying the inconvenience factor. If Novus Ordo Masses were scheduled for 3pm or only took place on the third Sunday of the month, what would be the size of their congregation be? Another factor is the need to allow congregations to build up. The experience is that, given a convenient time in a decent church with an able priest at a suitable location, Latin Mass congregations will grow. When the church of Sts Peter, Paul and Philomena in New Brighton was reopened by the Institute of Christ the King Supreme priest, the Sunday congregation was only about 40. Now it is about four times that and still growing. So, in judging the adequacy of provision, it is not sufficient to look at the attendance at existing Masses. The demand needs to be assessed and then considerable thought needs to be given to the best way of satisfying the demand, always mindful of the limited resources that are available. The above is a brief introduction to the current state of affairs in England and Wales. The next post will consider some possible ways forward. There is an interesting development concerning the provision of the Latin Mass in the Diocese of Leeds. A meeting took place last week involving Bishop Marcus Stock (Bishop of Leeds), Fr Tim Wiley (the priest with responsibility for Latin Mass provision in the diocese) and Neil Walker (the LMS rep for Leeds). It seems that it was agreed that there should be a church within the diocese that can be considered a "home" church for the Latin Mass. I am not sure whether this means a church that would be used exclusively for the traditional liturgy - I am presuming not. The idea is that new arrangements will be put into place in September when it is customary to move priests. Although there are Latin Masses every Sunday at two locations in the Leeds Diocese, there are others at venues and times that vary from week to week. I have always thought that this is an unsatisfactory arrangement, because people turn up at the wrong place or the wrong time. It seems that this problem may be rectified in the Leeds Diocese. It is also possible that the new arrangement may be even better with a church providing traditional liturgy exclusively, or almost exclusively. Such arrangements apply in the Shrewsbury Diocese at New Brighton, in the Lancaster Diocese at Preston and in the Liverpool Diocese at Warrington. In these three cases, one of the traditional orders of priests have been invited to take charge of a church that would otherwise be surplus to requirements. The Priestly Society of St Peter (FSSP) has, on average, been ordaining about 11 new priests each year, and has thus experienced steady growth. It currently has 262 priests. 2015 was a good year for ordinations with 15 new priests, and 2016 is also looking good with 14 ordinations expected. However, if all goes well, 2017 will be a record breaking year with 24 ordinations. That amounts to 53 ordinations in three years, or an increase in the size of the order of over 20%. I understand that ten young men from England and Wales are currently studying at FSSP seminaries ,so we can expect that England and Wales will benefit from the growth of the FSSP. The Latin Mass Society will be holding its annual residential training conference for priests, deacons, seminarians and servers wishing to learn the older form of the Mass at Prior Park, near Bath, from 4th to 7th April. Full details, including costs, are on the main website of the Latin Mass Society. This event is really worthwhile attending, and I would urge anyone who wants to learn these skills to consider attending. On Ash Wednesday, there will be a Sung Mass in the traditional form with distribution of ashes at 6pm at St Wilfrid's Church in York. Close on the heels of the Mass of Candlemas on 2nd Feb, is our regular first Wednesday Mass in Hull. Fr Peter Mulholland will be celebrating a Low Mass at 6.30 pm on Wednesday 3rd February at the Church of St Charles Borromeo, Jarratt Street, Hull. There will be a Sung Latin Mass in the Usus antiquior at 7.30pm on Tuesday 2nd February at the Church of the Most Holy Sacrament, Marton, to mark the Feast of Candlemas. Marton is a hamlet about seven miles to the northeast of Hull, and well off the beaten track. The postcode HU11 4LN may be useful for those trying to find it by satnav. The church was built in 1789, and is the second oldest in the diocese. It replaced various rooms and buildings around the Burton Constable Estate which were used for the celebration of Mass during penal times. The modest church was built three years before the Second Catholic Relief Act of 1791, and attached to the back of an existing farm house so that it could not be seen from the road. It also had a moat for additional security. The celebrant will be Fr Mark Drew who has recently been appointed as Priest in Charge of the parish of the Sacred Heart in Hornsea, which includes the Marton church. We now know that the funeral of Les Jones will take place at the Sacred Heart Church, Southgate, Hornsea, HU18 1RE at 11am on Saturday 9th January. The expectation is that there will be a Sung Requiem Mass. Southgate is the main street leading south from the town centre, and the church is easily found on the left as one travels south. I heard today that Les Jones has died. He was receiving treatment at Hull Royal Infirmary at the time. Les Jones is a long standing member of the Latin Mass Society, and served on its committee at one time. 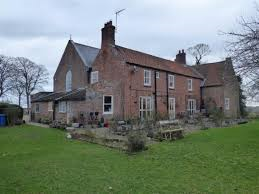 Recently, he has been attending the monthly Wednesday evening Masses in Hull, and some years ago, he attended the Masses in Hedon.